So are you ready to embark on this recapping journey with me of ‘Her Lovely Heels’?! I hope you are. Haha. The drama stars Kara’s Kang Seung Yeon (who I’m not a fan of) and Hong Jong-hyun (who I also am not a fan of, although it’s weird because I like his model-actor friends, Sung Joon and Kim Woo Bin. Did anyone say HOTTIES?!). The drama revolves around Shin Ji-hoo (played by Kang Seung Yeon) who “holds painful memories of her first love” while Hong Jong-hyun plays Oh Tae-soo, a man who is skeptical about love. However, when Tae-soo and Ji-hoo cross path, they will develop some kind of relationship that will change their ways of thinking and living. Episode one starts out with our female lead Shin Ji-hoo explaining the her daily routine. “It’s a busy morning in Seoul. Countless people start the new day with the sound of their hurried footsteps. The day starts like this. The reality behind those steps are filled with joy, happiness, and hope. I came to know it not long ago. Since the moment I had someone I like, my shoes that are filled with joy, happiness, and hope. With a fluttering heart I started to walk towards him. I met him one year ago, coincidentally at a shoe store.” And with that, our main character Ji-hoo stops in front of the shoe store that she met this guy she’s referring to. Oh Tae-soo (played by Hong Jong-hyun) is helping Ji-hoo try on different shoes. However, the small injury he notices on her feet causes him to freeze what he’s doing and stare her in the eyes. He hands her the bag of shoes she bought and is about to leave the store with her friend when he stops her to hand her a pack of band-aids. This moment leaves a huge and curious impression on Ji-hoo as she returned to the same store a few days later, but didn’t see him around. It’s been 3 months since Ji-hoo’s been working. She makes sure that to impress him, her heels remain 3 cm higher. Haha. She follows him to work in hopes that one day he will be aware of her feelings for him. Aww, so cute. A team meeting is currently being held and it is revealed that there will be a gathering later on. The Team Manager then asks Tae-soo about a scholarship that he’s in charge of only to then ponder over how it would be a great idea to have someone help Tae-soo by taking pictures. That’s when he selects Ji-hoo as Tae-soo’s assistant to which she happily accepts the task. Ji-hoo takes a loving glance at Tae-soo and smiles. 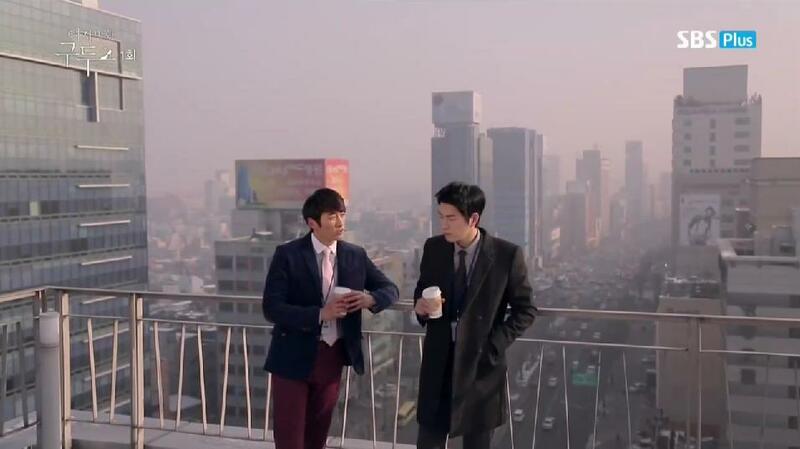 Tae-soo and his friend, also working in the same department as Tae-soo and Ji-hoo, are outside drinking some coffee when he teases him about Ji-hoo. He asks Tae-soo if he knows that Ji-hoo has a crush on him or if he’s just pretending to not know. Tae-soo was never aware about Ji-hoo having a crush on him, but now that he does, he doesn’t care. Tae-soo never possesses any feelings for any female employee at the company. Tae-soo adds that he doesn’t find any reason to take interest in her since she’s a new employee and because it’s not like they’re going to date anyways (ooh, you better take that back. Haha). Tae-soo believes that he will get married…when the right person comes. (and she did. Hehe). Ji-hoo is spending time with her friend, discussing over Tae-soo. Ji-hoo reveals that she likes Tae-soo because he works well and because he’s handsome (there’s no doubt about that. Haha). Annndddd because of the fact that he doesn’t smile at any girls which makes him all that much cooler. Hahaha. He’s also decisive and smart. Although Ji-hoo’s friend Lee Soo Young’s impression of Tae-soo differs a bit, she knows one thing for sure: that Tae-soo is better than the last guy that Ji-hoo was in love with. Ji-hoo would like to confess to Tae-soo, but she’s afraid of rejection and getting hurt. The best advice that Soo Young gives her best friend is for her to accept getting hurt and rejection if she does because love ultimately means accepting pain (oof, that’s deep stuff right there). Ji-hoo hopes for the miracle that the person she likes will like her back (this is exactly how I feel with my bias. Haha). Ji-hoo is riding in the car with Tae-soo and Manager Im who are all heading somewhere together. Ji-hoo takes notice of Manager Im’s great and fit figure and grows a bit jealous. While in the car, Manager Im abruptly states that she and Tae-soo are dating which throws both Tae-soo and Ji-hoo off. Tae-soo doesn’t know what Manager Im’s talking about (and I don’t either right now. Lol). He drops Manager Im at her destination, leaving Ji-hoo behind in the car with Tae-soo. While driving, Tae-soo recalls what his friend said about Ji-hoo harboring a crush on him now that he’s alone in the car with Ji-hoo. Just when she’s about to ask him a personal question, he dodges it by suddenly making a fast U-TURN which causes her to give up. “I lost the timing to confess,” Ji-hoo realizes while stealing a look at Tae-soo. Because Ji-hoo is now working with Tae-soo as his assistant, she has to follow him and take pictures of him working on the scholarship project. She manages to get a few shots of him secretly without him noticing. Hehe. While waiting for Tae-soo to finish his discussions with some officials, Ji-hoo walks back and forth on the sidewalk, but happens to get her heels stuck inside the crack of the sidewalk. She tries her hardest to get her heels out, but not in time as Tae-soo approaches her in confusion. After finally getting a grasp of the situation, Tae-soo volunteers to pull the heels out, but Ji-hoo refuses to let him. Tae-soo, who is now squatting next to Ji-hoo, gets pushed and hit in the face with Ji-hoo’s heels after she successfully manages to pull her heels out of the crack. He flies a million feet away while she also flies back, confused as to what had just happened. She’s laying on the ground lifelessly, her arms and legs spread all the way out, until Tae-soo approaches her which causes her to get to her senses and to sit back up. (LOL. I just had to screen cap this pose. It’s freaking hilarious!). Once Ji-hoo has finished grabbing her heel, she stands there awkwardly, waiting for Tae-soo. 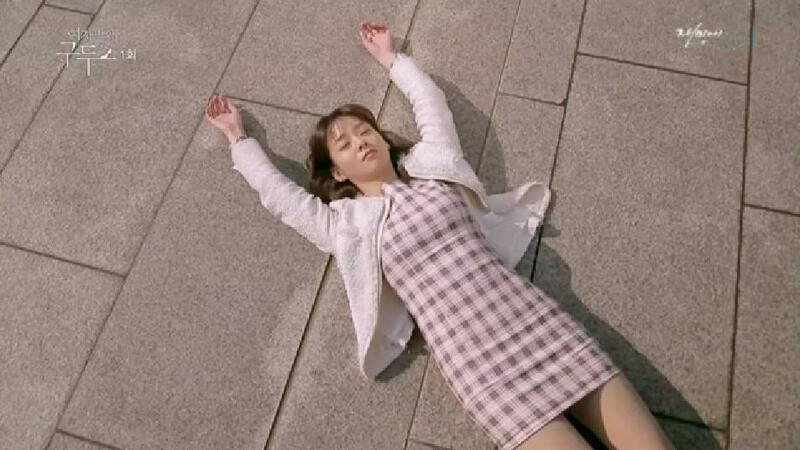 Tae-soo, on the other hand, notices a group of people who are on a tour of the campus, walking towards them and because Ji-hoo has a cut on her short dress, he approaches Ji-hoo by the back and places his coat around her to cover her (oommggggggg). The episode ends with Tae-soo covering Ji-hoo with his jacket and the two of them standing awkwardly with each other. OTL, this drama is going to be the death of me. 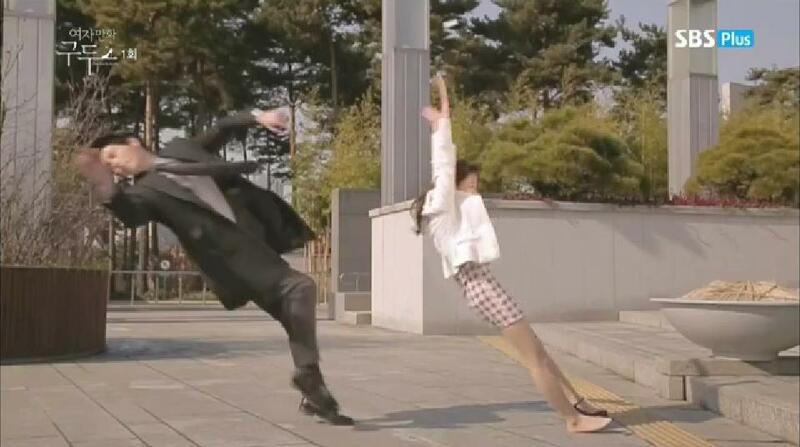 ‘Her Lovely Heels’ literally brings the word ‘cheesy’ to whole new different level, but I like this drama! I know, I’m weird, but I actually was surprised at how easy this drama was to watch and follow. Because I wasn’t a big fan of our female and male lead, I wasn’t so sure if I was going to like this drama or not, but I like it and I enjoy it. The last scene where Tae-soo covers Ji-hoo definitely reminds me of when Kim Tan did that to Eun-sang in ‘Heirs.’ In fact, episode one of ‘Her Lovely Heels’ could serve as a summary of all of the romance in all 20 episodes between Kim Tan and Cha Eun-sang in ‘Heirs.’ Lol. Another thing that I love love love about this drama is definitely – definitely the cinematography. There were multiple times in this drama where it was just so so breath-taking that I had to pause the drama from playing because I couldn’t get over how beautiful the drama was. I love all the angles, the quality, the visuals, everything is so perfect. The story line and plot is over done, it’s cliche, it’s mundane, it’s boring, it’s repetitive, and it’s old, but not every drama out there is directed as beautifully as ‘Her Lovely Heels’ is which is why the drama is refreshing and captivating. So far within the first episode, I have come to finding Hong Jong-hyun really good-looking. It must be that hair style he’s sporting. Yep, that’s definitely it. I never really found him attractive in the past, but in this drama, he looks really good! As for Seung Yeon, she’s doing decent so far. A bit awkward and stiff, but she’s not bad. Not bad. I’m actually genuinely interested in this drama and for the first time in a really long time, I am finally addicted to a drama within the first episode. Expect the recap for episode two to be up fairly quickly. Hehe.